CHENNAI : When you want to meet someone for anything besides lunchtime, what do you say? ‘Let’s meet for coffee.’ I wanted to change that.” This was the idea behind the successful chain of smoothie bars, Drunken Monkey founded by Samrat Reddy. Currently flaunting 50 stores across the country in not just cities but also Tier 2 towns like Guntur and Rajahmundry, Drunken Monkey has established a name in just two years. Announcing that they plan on expanding overseas by the end of this year, Samrat Reddy got talking about the journey of his start-up. An MBA graduate who studied in Scotland, Samrat had the idea to bring about a smoothie lifestyle in India even before he launched the brand. “Three years ago I set aside everything I was doing — I was part of my family business — and researched the prospects of a smoothie bar. A year after that we launched our first store in Madhapur, Hyderabad, and there was no going back since,” shares Samrat. The biggest challenge according to the founder is the inventory. “We have to source fresh fruits for the smoothies and they have shorter shelf life. I was advised by my mentors to not go down this road as I will be dealing with depleting resources. But I had made up my mind to introduce an option besides coffee or tea.”Samrat laughs as he explains why he named the chain Drunken Monkey. “When I thought of the brand, I always had a visual cropping up in my — a character. And I didn’t want to emulate a preachy ‘healthy drinks’ message. I wanted people to be high on smoothies and hence Drunken Monkey,” he says. While Samrat invested `5 crore into launching the brand, he admits that they mostly rotate the revenue as investments since. “When we have to open in a new town we have to put in about `1 crore to begin with. Now, however, with the number of stores we already have and the franchises coming in, we might not have to put in any more investment until we launch aborad,” he shares. 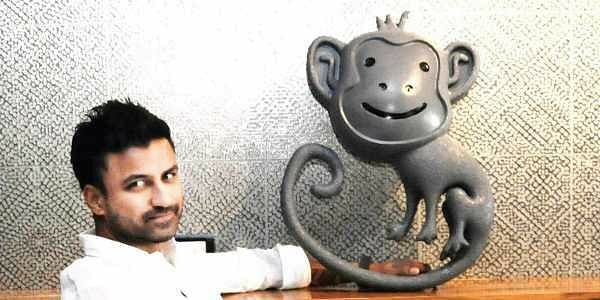 Drunken Monkey which started off with four stores in Hyderabad has now grown to 50 all over the country. While earlier Samrat owned over 15 stores and franchised the rest of them, he intends to increase the number of franchised stores as the brand grows. He says, “I don’t want to sit in a store and manage it. I want to have the time to manage my brand and the R&D.”Drunken Monkey is now planning to increase their store count o 150 in the country and will soon be expanding to Belgium, USA, Canada and Singapore. ● By the end of the year Drunken Monkey will be launched overseas.